Paddle board yoga is the ultimate yoga experience. If you are already at the apex of form from practising traditional yoga, paddle board yoga is the step up challenge that yogis can try. Every time you are at a yoga class or with people doing yoga, you will be able to invoke your fondest memories from your vacation in Phang Nga. Just imagine yourself doing yoga on a mat that is floating like a magic carpet. The meditating calm of the water and the tranquillity of nature all around you can bring you to the pinnacle of your transcendent yoga journey. 1: Paddle board Yoga is Fun! 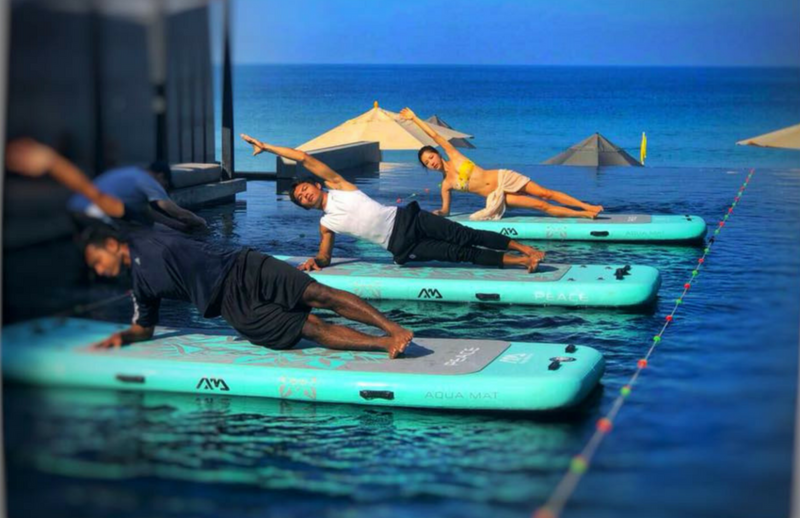 The whole idea of getting on a board in the middle of the ocean to do yoga is outrageous! Actually we tried the sea, but waiting on the right tide and conditions, does not make it ideal for regular sessions, so we use our infinity pool. Yoga starts out quite easy. Most people are able to do downward dog and many yoga moves without a whole lot of practice. The more advanced yoga takes years of practice, flexibility, strength, stamina, and relaxation to master. Just when you thought you were at the top of your game, paddle board yoga presents a new challenge. Having to balance your yoga moves on water requires every ounce of your core strength. You will benefit from a more comprehensive workout of all those tiny balancing muscles that are rarely activated. This is similar to the advantage of free weights over weight machines. These small balancing muscles are what really make your body look sleek, and toned. After you have mastered some yoga moves on a paddle board, even the most advanced yoga moves on dry land may seem far less challenging. The confidence and experience may help you excel in your regular yoga classes. When you are out on your board in the calm of the water in that perfect balance of nature, you are essentially walking on water. You overcome your fears of falling and failing in life by experiencing the balance and precision that allows you to stand above everything. The tranquillity of the journey and oneness with water and its breezes can help you achieve a higher state of calm. Instead of absorbing the subtle vibrations of the terrestrial landscape, you will feel the liquid living organism of Mother Earth bonding with your soul and spirit. Water is known for being the most soothing sound to help anyone relax. They sell sleep machines that play nothing more than ocean waves ebbing and flowing to help people relax and fall asleep. Most Yogis teach a special breathing technique called Ujjayi Pranayama, that is otherwise known as "Ocean Breathe." When you are actually breathing in the fresh ocean air and meditating in the ocean, you will reach the highest plateau of your transcendent yoga experiences. If you like to post your photos on Instagram or share them on Facebook, you will have a lot of photo moments to turn this beautiful vacation paradise into golden memories. When you are out there posing on that paddleboard, that is a photo that friends and family will love. If anything, you can make the experience a conversation piece and spiritual souvenir of the adventure you had Phang Nga. Whatever your reasons may be for wanting to paddle board, our professional instructor will give you the guidance you need to make the adventure safe and thrilling at the same time. By perfecting your form on this advanced medium of training, you will be all set for tightrope walking classes in the future. Is that the next big thing for land-lovers, Tightrope Yoga? You never know.